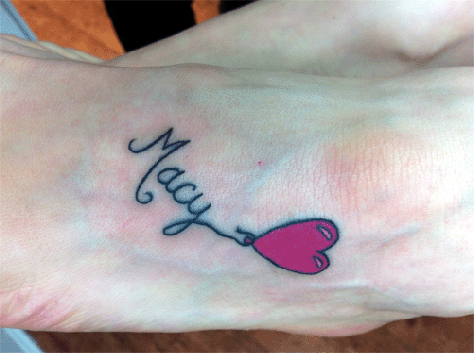 I had a tattoo done for Macy. As we draw near to the 6 month anniversary of her death I keep being reminded how much she has changed my life, and the lives of those closest to me. None of us will ever be the people we were before. Instead we will be slightly altered versions of ourselves. But without doubt they are positive changes. How can they not be when we have been touched by such a special person? The last six months have been so painful. Filled with a constant aching loss for Macy. The need to hold her, to touch her, to hear her and to ‘breath her in’ an overwhelming feeling of being out of control and unable to protect my own baby. But during this time, almost 6 months, we have continued to raise awareness of CHD, we have raised over £10,000 for Team Macy supporting The Royal Brompton and we have gotten through each day.